"It is related that Isaac, who lived as a solitary at Constantinople, when he saw Valens marching out with his troops, cried aloud, 'Where are you going, O emperor? To fight against God, instead of having Him as your ally? It is God Himself who has roused the barbarians against you, because you have stirred many tongues to blasphemy against Him and have driven His worshipers from their sacred abodes. Cease then your campaigning and stop the war. Give back to the flocks their excellent shepherds and you shall win victory without trouble, but if you fight without so doing you shall learn by experience how hard it is to kick against the pricks. You shall never come back and shall destroy your army.' Then in a passion the emperor rejoined, 'I shall come back; and I will kill you, and so exact punishment for your lying prophecy.' But Isaac undismayed by the threat exclaimed, 'If what I say be proved false, kill me' (Eccl. Hist. Bk. 4, Ch. 31). On August 9, 378, Valens' army engaged the Goths in what would later become known as the Battle of Adrianople. The Goths utterly defeated the Roman army, and Valens fled into the countryside with his generals. Valens and his generals took refuge in a barn filled with straw, which the Goths surrounded and set ablaze, the emperor perishing as Isaac had foretold. After Valens had been confronted by Isaac and enraged him with his prophecy, the emperor had Isaac imprisoned in order to be punished upon his return. Some of the soldiers that survived the battle came to Isaac's prison cell and said to him, "Prepare to make your defense before the emperor, who is coming to fulfill what he spoke against you." Isaac calmly answered, "It has already been seven days since I smelled the stench of his bones, which were burned in the fire." The Orthodox emperor Theodosius I succeeded Valens. Having heard of Isaac's prophecy and its fulfillment, Theodosius released him from prison and summoned him to appear before him. The emperor prostrated himself before the elderly monk, asking his forgiveness. 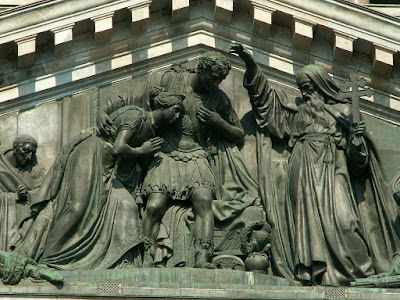 Theodosius did as Isaac had petitioned Valens, also exiling the Arians from the city for their persecution of the Orthodox. Having restored peace to the Church in Constantinople, Isaac wanted to return to his life in the wilderness. However, he was persuaded to remain in Constantinople. 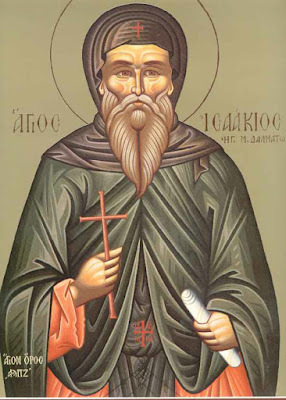 A wealthy aristocrat named Saturninus built a monastery for Isaac within the city, where he lived in ascetic struggle, working many miracles. Isaac is also known for his zealous witness to the Orthodox faith at the Second Ecumenical Synod, convened in Constantinople in 381. 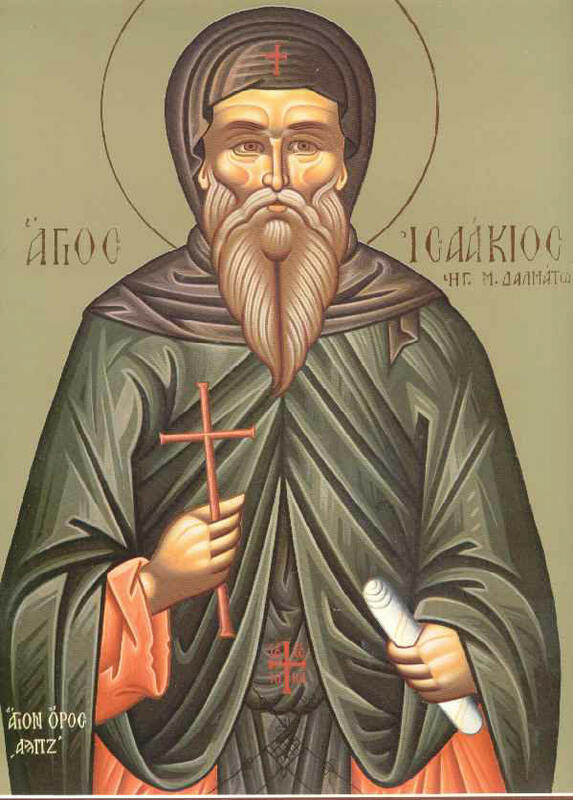 Towards the end of his life, he entrusted the leadership of his monastery to his closest disciple, Dalmatos (Aug. 3). It is believed that the monastery founded by Isaac took its name from this Dalmatos. However, according to another tradition, his monastery was originally built by Dalmatos the Patrician, a nephew of Emperor Constantine the Great, and it received its name from him. Yet others maintain that it received its name from both of these, and that is why its name in Greek is in the plural, Dalmatoi instead of Dalmatos. Isaac is believed by some authorities to have died in 383, although others place his death around 396. However, neither of these might be accurate; the life of John Chrysostom includes mention of Saint Isaac living into the fifth century. 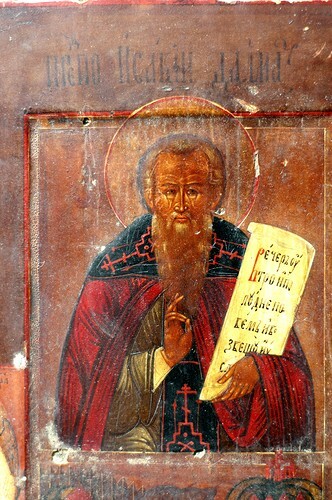 At least one account says that John, as Archbishop of Constantinople, disapproved of monks who roamed the streets visiting friends in their private houses, out of his concern that the monastic reputation would be marred. Those who did not approve of Chrysostom's new rules brought their complaints to Isaac, who in turn is said to have voiced them at the Synod of the Oak in 403. According to Zonaras, the Iconoclast Emperor Constantine Copronymus later turned Dalmatoi Monastery into a barracks: "And as for the Monastery called Palmatos, which is ancient and the oldest of all those in Constantinople, after he had expelled the monks, [the Emperor] made it a barracks for soldiers" (Chronicle, XV, 8). The Third Ecumenical Synod raised its abbot to the rank of archimandrite and exarch of the prominent monasteries of the imperial city. Tsar Peter the Great of Russia (reigned 1682-1725), whose birthday fell on Saint Isaac's feast day, May 30, adopted Isaac as the patron saint of the Romanov dynasty. Saint Isaac's Cathedral in the city of Saint Petersburg is consecrated to his honor. 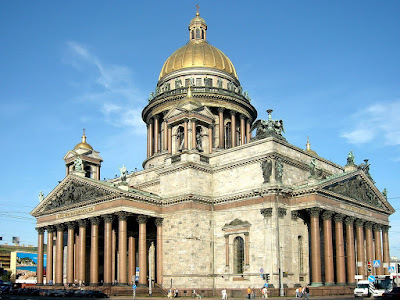 It is the largest Orthodox basilica and the fourth largest (by the volume under the cupola) cathedral in the world. 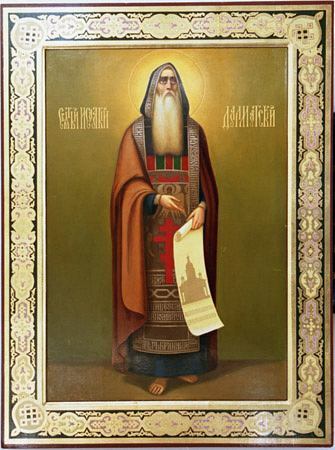 Thou wast a model of abstinence and a foundation of the Church, O Isaac, bright light of the Fathers; for thy life was radiant with virtues, and thou didst openly proclaim the Orthodox faith. O Venerable Father, pray to Christ our God to grant us His great mercy. Thou model of observance for monks and teacher of piety, thy servants praise thee, O God-bearer. As thou art the dwelling-place of divine grace, make us temples of the light of the Spirit, for we cry to thee: Rejoice, O Father Isaac.